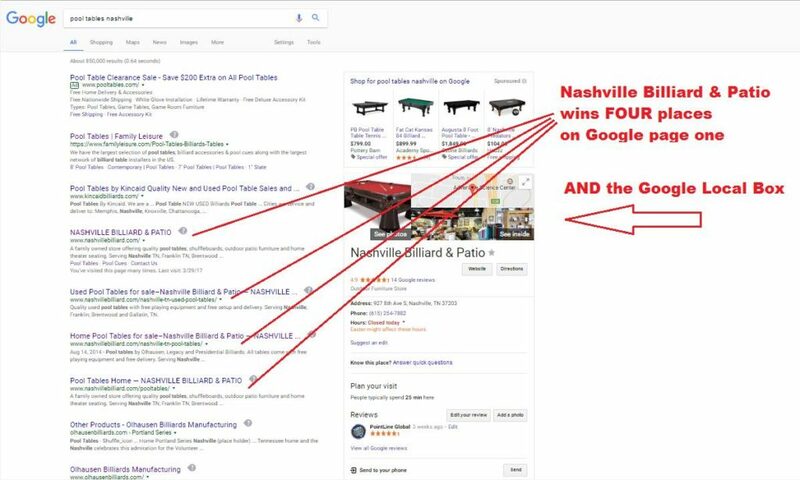 Working in the Billiards Industry, we positioned SEO client Nashville Billiard & Patio firmly at the top of Google’s First Page rankings for most all of their target keywords. Customers call Nashville Billiard & Patio directly from the website every day. Nashville Billiard & Patio now enjoys FOUR positions on PAGE ONE of Google search for Pool Tables Nashville! Explore how your Billiards or Home Leisure business can enjoy improved visibility and increased traffic.